A video shared by the police department shows how the bride was rescued from her stranded car. The flooding was fierce and unexpected in Bergen County, New Jersey, Saturday night. A car holding a bridal party became submerged in water, and the bride popped up through the sunroof - still in her wedding gown and shoes. Rain fell as the flood waters rose on the street along the overflowing Hackensack River in the small borough of Bogata. 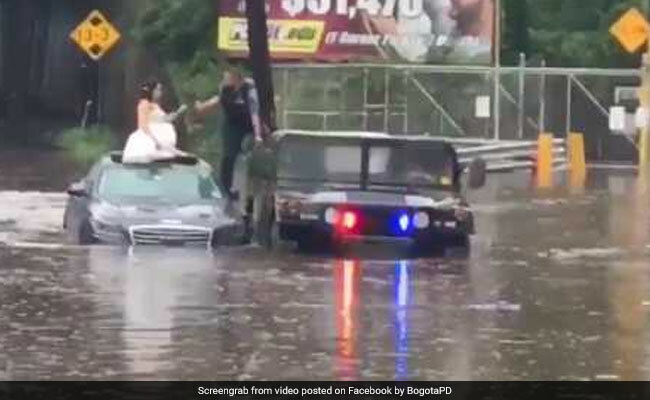 "Unfortunately due to the quickly rising flood waters, this bride, her new husband and wedding party friends, got a rough start on things," posted the Bogata Police Department on its Facebook page. Then the posting went for a little humor: "The fortunate thing, is we were able to help them through their first rough patch." Bogata police officers pulled up in a Humvee and helped the bride as she shed her shoes and gracefully climbed out of the sunroof, stepping from the top of her car into the Humvee, according to a Facebook video of the rescue posted by Bogata police. "This was not the normal flood! !," posted the department. "This came to over 4 ft high from up stream, in less than 15 minutes "
Sgt. Geoffrey Cole and officer Michael Laferrera came to the rescue around 6:15 p.m, according to the Hackensack Daily Voice. "We were pretty shocked to see it was a bride and her new husband and their bridal party friends," Cole told the news site. Extending an arm, Laferrera helped steady the bride, identified by the Hackensack Daily Voice as cosmetologist Sabrina Torrens. The groom and the wedding party followed to safety in the Humvee. "It's definitely not the kind of thing we see every day," Cole told the news site. On Facebook, the department noted that the couple was away on a honeymoon, and wished them lives filled with joy and adventure (no mention of floods): "Obviously their day has not gone as planned, so let's congratulate them on their wedding and give them best wishes for a lifetime of love and adventure, starting now."